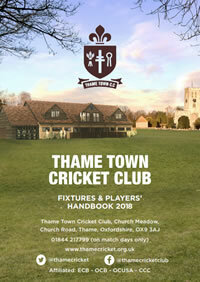 thamecricket.org.uk (“the Website”) is owned and operated by Thame Town Cricket Club (TTCC). This policy, together with our Terms and Conditions, explain how TTCC may use information we collect about you, as well as your rights over any personal information we hold about you. Please read this policy and our Terms and Conditions carefully; by accessing the Website you confirm to have understood and agreed to them. Your personal information is safe with us and will never be released to companies outside TTCC for their marketing purposes.